Born in 1972, Dhaneshwar is a farmer and part of a Kushan group and has been performing for thirty-five years. His father, Jatin Chandra Barman was a Geedal and Dhaneshwar joined his group as a child. He never went to school and was about twelve years old when his father`s group disbanded. He then joined Lalit Kushan`s group as a chhokra - dancing and acting as required. He also picked up the Bena and started learning to perform the instrument. After spending about ten years with Lalit Kushan, he left to start his own group. He performed with his group for about fifteen more years before the group broke up, as a result of declining demand and diminishing respect for the form among the people. However, from 2014, Dhaneshwar has rejoined a Kushan group under Mahim Geedal and is performing again - though the form is now a mix of pala gaan and jatra. He travels around North Bengal giving performances. The form, in its new avatar, though offering more income for people like him, is still not enough for a livelihood. They are a group of 26 (including a Casio master these days) each of whom receives about Rs 350 per night. 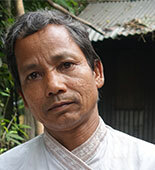 He is a self taught Bena maker as well and has made only 4 Benas in his entire life. Two for his present guru, one for a friend and one for himself.